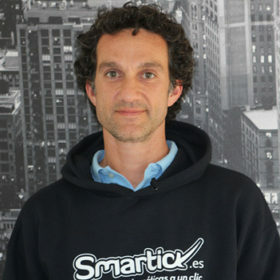 Javier Arroyo is the co-founder of Smartick. He graduated with a BA in Economics from Universidad Autónoma de Madrid and afterward went on to receive an MBA from Solvay Brussels School. He is an Eisenhower Fellow. Javier has taken a few laps around the world and as a child experienced, even enjoyed, educational systems in four different countries: USA, Germany, Belgium and Spain. Javier was a founding partner of Fast Track, sold later to the international media group WPP. Prior to Smartick, he accumulated a work experience of 9 years in over 10 countries (USA, UK, Germany, Austria, Belgium, Luxembourg, Poland, Italy, Switzerland and Spain) in areas that include Strategic Consulting (Accenture and Monitor Cie), Marketing (Fast Track Sport Media Consulting) and Institutions (European Commission).